"Banged up to the eyes." Honored by Indians as one of the "Precious Things" recovered at the birth of the universe from the primeval sea, Indian hemp or cannabis, as this narcotic plant is more popularly known, was taken by the king of the gods to gain immortality. In Sanskrit the plant is called Vijaya or Conquest, because it is supposed to have granted victory to those gods who used it. 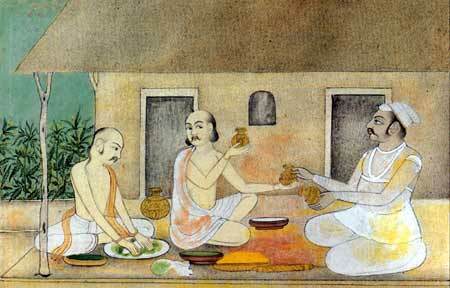 In time, a cannabis potion known as bhang became the accepted pleasure drink of Siva, Lord of wandering ascetics. Indeed, an affectionate folk name for Siva in this mode is Bhangeri Baba or "bhang‑exhilarated Father." During the medieval period, bhang entered the temple, taken by temple celebrants as a ritual drink to reach religious ecstasy. As a ceremonial sherbet it entered the pleasures of the court. Ground very fine, hemp was sifted through muslin that had been refolded up to six times. Then it was blended into thickened milk and seasoned with crushed almonds, lotus seeds, black peppers, aromatic herbs, and cane syrup. Bhang was	also widely used by the general populace during the spring celebrations of the Holi festival, which followed the winter harvest, when feuds and social classifications were joyfully dissolved in uninhibited gaiety. At first a stimulant, exhilarant, and aphrodisiac, thereafter a sedative, the active principle of Indian hemp lies in the plant resin. Forty percent of this principle was used in the resinous hashish smoked by the wandering sects of India; 26 percent in the dried flower heads smoked in the villages of India as "ganja";	and only 10 percent in the ground green leaves used for the preparation of the	bhang drink. Ayurvedic medicine used hemp for the alleviation of migraine headaches and stomach	spasms. Today it is still valued for its beneficent effect on migraines and	neuralgia. A recognized analgesic, hemp is an antispasmodic and an anodyne or pain soother. It is also known to promote digestion and to assist in the flow of urine. The plant's widespread medical, religious, and recreational uses in India were noted by a sixteenth­ century Dutch botanist, John van Lincschoten, in His Discours of Voyages into Ye Easte and Weste Indies (1598): "They have many kinds of Drogues, such as Amfira or Opium, Camfora, Bangue, and Sandall Wood."